Like most film collectors I started out buying short silent 8mm films produced by Castle Films, Columbia, etc. My very first film was Castle’s Standard 8 silent 200 foot version of FRANKENSTEIN MEETS THE WOLFMAN which I purchased by mail through an ad in FAMOUS MONSTERS OF FILMLAND magazine. And yes, I still have it! I was hooked! This was in the late 60’s and I started my collection with silent Standard 8 and later, Super 8 films which I either ordered by mail or found in department stores. Prices for films of this length averaged between five and seven dollars. It must have been around 1970 that I stumbled upon an ad for a 200 foot film for only $1.00! 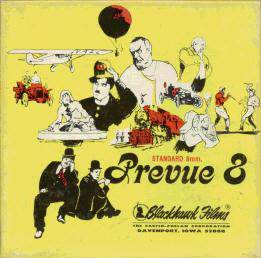 It was called PREVUE 8 and contained scenes from great classic silent films from a company I’d never heard of - Blackhawk Films! Needless to say I ordered it right away and after what seemed like years, but was probably about two weeks (hey, I was only 10 years old) the package arrived! Immediately, I threaded up the old Kodak Brownie! There on my own screen were Charlie Chaplin, Laurel and Hardy, Lillian Gish, John Bunny, Lon Chaney (The Wolfman’s dad! ), clips from historic newsreels and lots of other really neat stuff, much of which I’d never heard of before! I know I said I was hooked before, but now, suddenly, I was a maniac! I looked at the catalog that came with PREVUE 8 and nearly died on the spot. It was huge and offered real movies, not the little cut up toys I’d been collecting, but complete shorts and feature films! 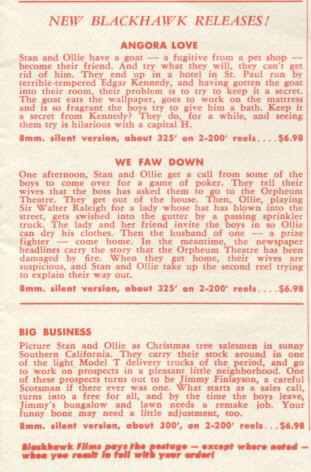 Some of the 8mm features sold for astoundingly huge amounts of money, many of them were over $50.00! Remember, I’m still just 10 years old here. I knew I had to get some of this stuff but I also knew I had to start modestly. I hoarded my allowance for months until I’d accumulated the lordly sum of $25.00. It wasn’t easy. I decided to go for it and spent the whole shebang on my first two complete shorts: THE IMMIGRANT with Charlie Chaplin and SPOOK SPOOFING with Our Gang. By the way, in these early days a two-reeler was really a two-reeler, at least in 8mm. The films came in a cool double-decker box with one 200 foot reel neatly stacked on top of the other. It wasn't until a few years later that Blackhawk began mounting them on a single 400 foot reel. You could always tell which ones came on the single larger reel because they always sold for a dollar more: $13.98 instead of $12.98! Before long, I acquired a paper route to support my habit and spent a lot of time waiting to ambush the mailman once he got near our mailbox. By the time I graduated Grammar School, I had saved enough to buy my first Dual 8 sound (SOUND!) projector, a Eumig 807D. In case you’re wondering, my first sound film was Laurel & Hardy’s THE LIVE GHOST in Super 8. I haven’t looked back since. In the years to come I’d move up to 16mm and even build a screening room in my house. I’ve made friends with some terrific people who share this crazy hobby, many of them through this site. I guess the point of all this is to illustrate what an impact Blackhawk Films had on me. I never dreamed that 30 years later I’d have the privilege of representing the Blackhawk Library, not to mention the Golden Era Library as well as Derann. Nowadays Derann is the only one of these still in the home film business. The Blackhawk Films library is primarily the accomplishment of Kent D. Eastin, who started business in 1927 making film ads for merchants, filming local news events for theater newsreels, and selling outdated, independent 35mm theatrical film prints for toy projectors of the day. All of this from the basement of his parents’ home in Galesburg, Illinois. With the advent of 16mm sound film in 1934, Eastin moved his company to Davenport, Iowa and began a rental library that flourished until it was discontinued under the impact of television in 1957. Eastin selected Davenport as an efficient junction for rail shipping and because it was something of a "film town", as home to the Victor Animatograph Corporation, a pioneer motion picture equipment manufacturer. Martin D. Phelan, with background in direct mail and management, left Montgomery Ward to partner with Eastin in 1947, and assume responsibility for the business side of the developing company. The Blackhawk name was first used for an auxiliary business, liquidating stocks of used 16mm prints from British Information Services, Mills Panoram Soundies and other libraries and producers. 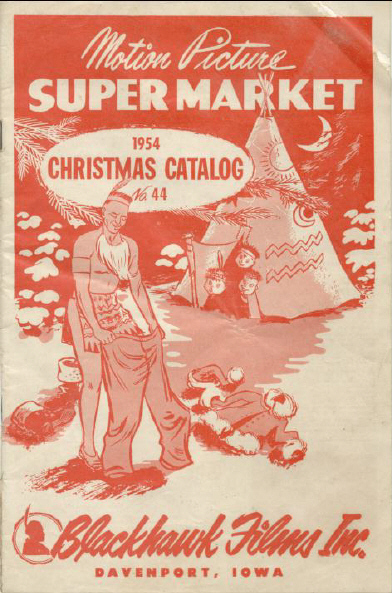 Blackhawk began publishing monthly catalogs in 1949. More than 2,500,000 used films were sold by mail order before this business was discontinued in 1981. 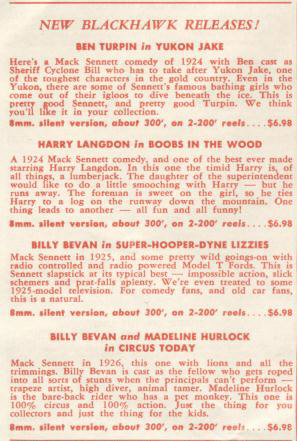 In 1952, Blackhawk introduced its own releases in both 8mm and 16mm. Included in this "Collector Series" were Laurel and Hardy silents from Hal Roach Studios, authorized editions of Keystone comedies licensed by Sennett’s original backer, Roy Aitken and a grouping of railroad films (Kent Eastin was an avid train enthusiast. He had a basement wall of bound timetables). 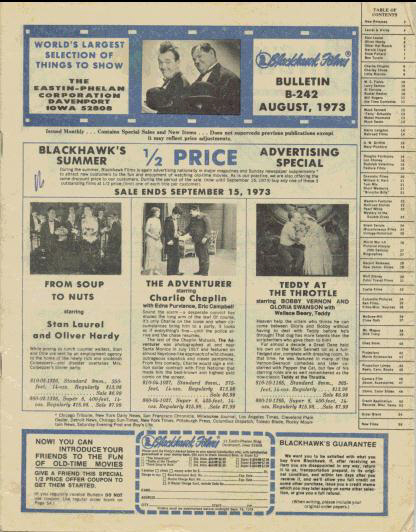 In time, Blackhawk grew to dominate the "home movie" field with a base of 125,000 customers. Boasting up to eighteen new releases every month, an in-house film restoration facility better than any then possessed by an archive, and more than ninety employees working in a picturesque century-old building of roughly 30,000 square feet. Fox Movietone News, Killiam Shows and National Telefilm Associates (now Republic Pictures) joined Hal Roach as important suppliers for film releases and television production was added to the company’s successful endeavors. David Shepard, the present owner of the Blackhawk Library, was employed by Eastin-Phelan during these years. 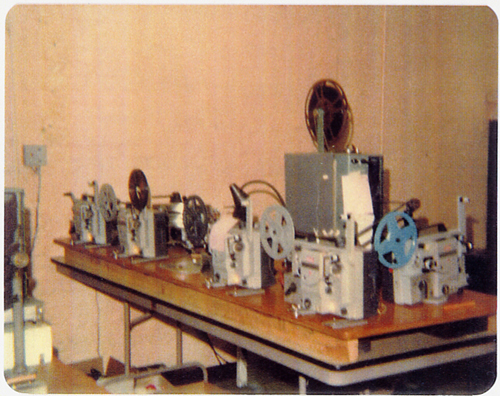 David began working closely with Kent Eastin from the American Film Institute in the late 1960’s to ensure permanent preservation of Blackhawk’s unique original films at the Library of Congress. He joined the organization in 1973, becoming Vice President of Product Development. In 1975, Kent Eastin and Martin Phelan sold Blackhawk to Lee Enterprises, Inc., a successful newspaper and broadcasting conglomerate. Blackhawk wrestled with the requirements and styles of new managers just at the time video cassettes began to redefine home entertainment. Basic decisions to emphasize mail order sales instead of unique product line and heavy investments in the Betamax and CED (RCA mechanical video disc) formats proved very costly. Lee Enterprises sold the company to its Blackhawk management team, who struggled on until 1985 when Republic Pictures bought it for direct marketing of their home video line. Republic discontinued film sales and closed the Davenport facility in 1987. It was the end of an era and a sad day for film collectors the world over. 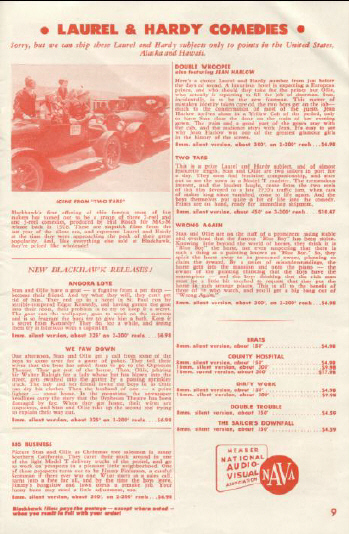 Here are some neat scans of Blackhawk catalogs from days gone by - enjoy! All pictures taken on the same day in September 1977. Courtesy of Shorty Caruso. 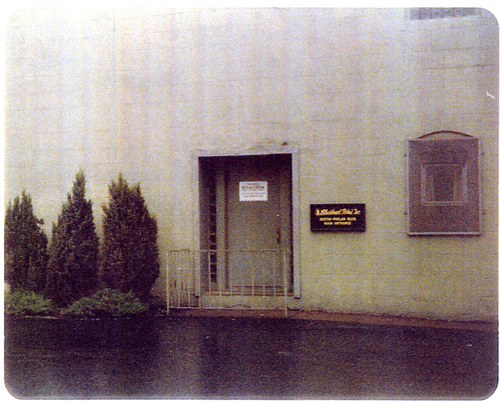 The main entrance to Blackhawk Films. They were located in an old brewery building. 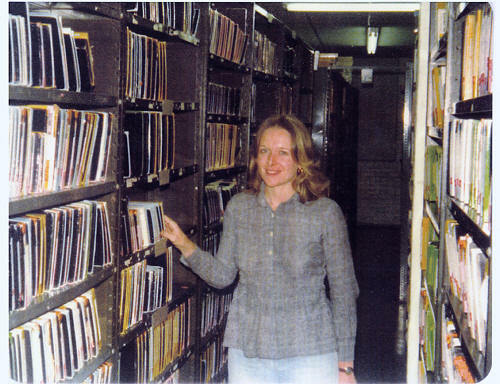 An employee of Blackhawk films among racks of film. There were about twelve rows such as the one pictured here. 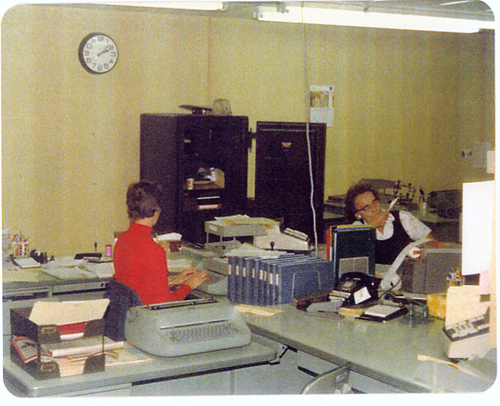 General office scene at Blackhawk Films. Catalogs (in red pile) waiting to be mailed. 16mm projector putting sound onto Super 8 magnetic tracks on Super 8 projectors. Blackhawk Films Building Struck by a Derailed Train! I think most of you are familiar with Blackhawk Films. Founded by Kent Eastin and Marty Phelan, it was one of the most revered companies dealing in classic films throughout the world. Its distribution went to all corners of the globe. The company's impeccable business methods; its honesty in advertising and "above-board" dealings; its "no gimmicks" sales; and its manner of unhesitatingly correcting any complaints from customers, without questions, made it world famous. Originally dealing only in film; the company would accept any title back for credit without question, unless the complainer abused the policy. Blackhawk was accepted as the finest, most reputable company in the classic movie collecting industry. It had the finest quality available, worked only from the best available preprint material and had highly competitive prices. 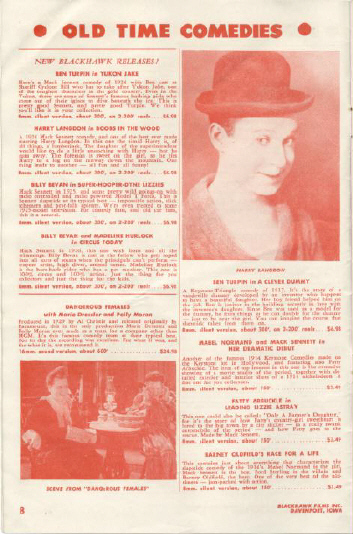 It was with great elation, like a dream come true for me, when Blackhawk purchased CLASSIC FILM COLLECTOR, predecessor to CLASSIC IMAGES, and I moved to Davenport, Iowa as editor. At that time Ted Ewing was president of the company and Carl Lange and Tom Voss were vice presidents. When I arrived at Blackhawk they had many employees. Shortly thereafter, the officers of Blackhawk decided to buy the company back from Lee Enterprises, which had purchased it some years prior to that time. Although I retained my office in the Blackhawk building, I elected to remain with Lee, the parent company. Then video began making inroads into the classic film market and Blackhawk's business began to drop off. The company made a stab at the video game, apparently unable to compete with some of the major video companies. As the business went down hill, fewer employees were needed to fill the orders, as countless collectors began to turn to video. Blackhawk also opened several retail outlets and they, too, apparently went down the drain. Finally, the company was purchased by Republic Pictures, probably (my opinion) because of the reputation and trustworthiness of the Blackhawk name. Republic moved the business to California. All the offices in the Davenport building were vacated except two: mine and the office of the Eastin-Phelan Company which, at this time, dealt mostly with schools, rental libraries and commercial outlets. My office was finally vacated when I retired and Eastin-Phelan moved to another location. 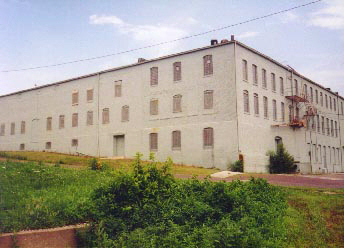 The huge Blackhawk building, which had two floors above ground level and three below (it was a former brewery) was adjacent to a railroad siding. 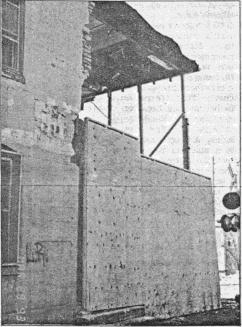 On February 28, 1993 a train derailed and crashed into the building. 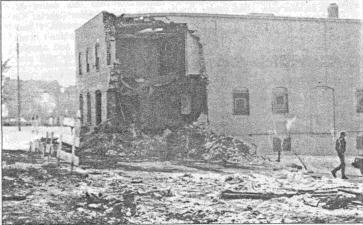 The Quad City Times reported, "...a 75,000 pound rail car filled with lumber crashed...about 1:30 AM...into1235 5th Street, ripping a hole in a portion of the historic structure..." The building was constructed in the 1880's, had rock walls and contained caverns where beer was kept during its days as a brewery. 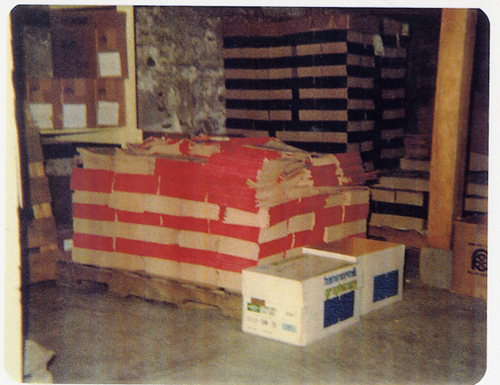 These caverns later provided the ideal cool environment for Blackhawk's film storage. I thought at the time, "That's truly the end of an era!" But, like many champions, the Blackhawk building "came back" and is again being used as a business site. PLEASE FEEL FREE TO EMAIL YOUR OWN COMMENTS OR MEMORIES: info(at)reelclassicdvd.com.